Fingal County Council has welcomed the announcement by the North East Fisheries Local Action Group that seven projects in Fingal will receive grant aid totalling €183,947 which will deliver a total investment of €365,894. 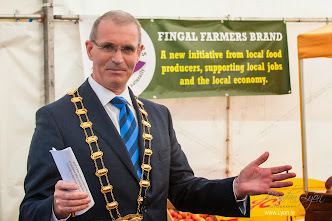 The announcement was made by the Minister of State at the Department of Agriculture, Food and the Marine, Andrew Doyle, TD, at a function hosted in the National Maritime Museum of Ireland, Dun Laoghaire, by Bord Iascaigh Mhara and FLAG North East. The launch was attended by Cllr. Kieran Dennison, Chair of the Fingal County Council Strategic Policy Committee for Economic, Enterprise and Tourism and David Pryor, Fingal County Council’s FLAG North East Board Member. Overall, 13 FLAG projects were approved which will deliver an overall investment of €434,337 across coastal communities in Dublin, Louth and Meath with the seven Fingal projects accounting for 80 per cent of the total investment. These projects will generate 15.5 full-time new jobs and support an additional 15.5 indirect jobs as they contribute to showcasing the seafood, heritage and tourism offering of the coastal communities of the Northeast FLAG region, while also helping create a sustainable future for those communities. Fingal County Council has been an active member of the FLAG North East Board since 2012 and held joint funding events with Clann Credo, Fingal PPN, LEADER and a number of animation events and project workshops in Fingal in 2016 and 2017, following the finalisation and launch of the seven national FLAG strategies. Cllr. Kieran Dennison noted the “strong role Fingal based projects plays within the FLAG North East region in particular with in Food, Heritage and Tourism markets”. The Chair of FLAG North East, Garret O’Brien, added that “a high level of interest has been conveyed from recent workshops held in County Hall in Swords and we are taking project applications up to September 15, 2017 for 2017 and 2018 for investment purposes”. The FLAG North East area comprises the coastal zones of Counties Louth, Meath and Dublin and has a relatively strong urban structure with 77% of electoral divisions falling into the aggregate urban category of over 1,500 inhabitants. In the three Counties, the most densely populated zones are located in the coastal regions. It is one of seven regional FLAG groups that operate under the FLAG programme, co-funded by the Exchequer and European Maritime and Fisheries Fund (EMFF) and contributes to the Action Plan for Rural Development. Administered by BIM, the scheme will provide €12 million in funding to Ireland’s coastal communities over the duration of the programme from 2014 – 2022. Source: BIM, July 28, 2017.